Gallery 19C, a Los Angeles based gallery specializing in 19th Century European Paintings, announced today the sale of LE PARADIS PERDU, (Paradise Lost), by Alexandre Cabanel, to the Musée d'Orsay in Paris. Polly Sartori, Director of Gallery 19C, commented, “We are seeing a resurgence of interest in 19th Century European painting and specifically in the great Academics like Bouguereau, Gérôme, Cabanel, and Baudry. Being a new gallery with the mission to handle the very best examples of 19th Century European paintings, when almost everyone is focusing on Contemporary Art, the Musée d'Orsay's purchase is a positive statement in support of our mission." In 1867, Alexandre Cabanel sent five of his most acclaimed pictures and the massive Le Paradis Perdu (Paradise Lost) to the Exposition Universelle in Paris. 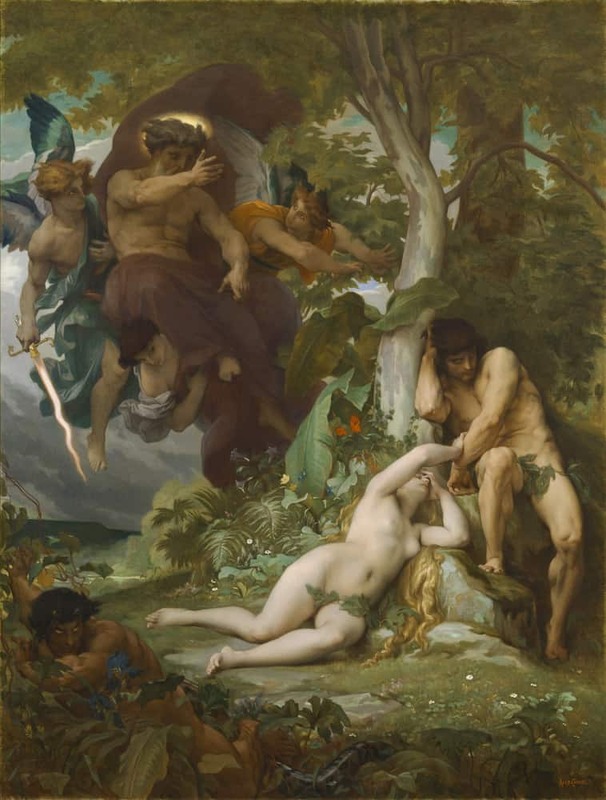 This work, a new painting depicting the Biblical story of Adam and Eve, immediately earned Cabanel the highest awards and honors and solidified his place as France’s leading Academic painter of the Second Empire. Its destruction in Münich during World War II might have been one of art history’s greatest losses were it not for the numerous preparatory sketches and detailed versions that Cabanel had made. The present painting, one of Gallery 19C’s masterpieces of the advent of the Belle Epoque, is the closest to the original in size and composition and the only documented répétition of the subject in Cabanel’s expansive oeuvre. Intended for King Maximilian II of Bavaria as part of a larger tableau of thirty decorative historical canvases for his Foundation “for the gifted,” or Maximilianeum, Paradis Perdu was to be the artist’s most important and largest commission for an institution outside of France. Cabanel had already, by the 1860s, undertaken many mural schemes, complex iconographic programs, and decorative cycles in public buildings and private residences and his prowess as a religious painter, in the tradition of the great Italian Renaissance masters, had been noted by no less influential a figure than the critic Théophile Gautier. “One can see,” wrote Gautier in 1852, “how he has eaten the bread of angels [Psalm 78: 25] and nourished himself on the marrow of lions,” (Théophile Gautier, “Beaux-Arts, Salon de 1852,” in La Presse littéraire, 16 May 1852). The training Cabanel would have received as a young Academic painter was based, above all else, on copying canonical works by Old Master painters from the Renaissance onward and classical sculptors from the ancient world. Upon completion of hundreds of such copies, students at the Ècole were allowed to make studies from life, producing works that, ideally, combined artistic convention with originality and innovation. In Paradis Perdu, many of the compositional details are drawn from these earlier masters, and from Cabanel’s own, historically-inspired paintings, creating a uniquely self-reflexive catalogue of Renaissance and Academic figurative art. (The origins of this work, with its hierarchical arrangement of muscular figures, inspired use of chiaroscuro, and overtly narrative qualities lie with Raphael, Michelangelo, and Milton, whose Paradise Lost should, some critics believed, be read alongside Cabanel’s highly literary canvas.) Even here, however, Cabanel’s originality could not be suppressed: Rather than burdening Eve with the strictures of past religious paintings or rendering her with the dreamlike and idealized qualities of his own, earlier female protagonists, the artist infuses her instead with an element of the odalisque, bringing her effectively down to earth. The incongruity of this maneuver did not seem to trouble nineteenth-century viewers: An oil study for the figure of Eve – one of at least 35 such individual figure studies for this single composition – entered the collection of the fairly conservative Hercules Louis Dousman II of St. Louis, MO in December 1879, and her comportment as a whole had a clear influence on at least one of Cabanel’s illustrious students, Fernand Pelez (1843-1913), whose own Adam et Éve (Moulins, Musée départemental Anne de Beaujeu) was exhibited at the Paris Salon of 1876. In Cabanel’s version of the provocative subject, Eve lies prostrate under the Tree of Life, shielding her face with her arm and contorting her body in the shameful agony of her expulsion from Eden. Such melodramatic gestures were typical of Cabanel, whose explorations into the expressive potential of body language through nineteenth-century theater and opera may be traced directly from this picture to his most famous work, The Birth of Venus of 1863, an ostensibly vastly different painting in theme and tone. (It is perhaps no coincidence, given this trajectory, that both pictures feature the same languishing model.) Adam slouches by her side, glowering outward, his hunched shoulders and darkened visage indicating his own dejection and contrition. His slightly elevated position and disengagement with Eve's grasping hand suggest the discordance that has grown between them. To the left of this pair, God the Father and a pair of vengeful angels cascade down from the heavens, their energy reflected in the wing-like locks of hair swirling around their heads. The glistening sword of one of the angels, with its undulating blade, underscores the figures’ dynamism; it also echoes the sinuous lines of Eve and her naked body, adding emphasis to her carnal sin. The retreating Satan, seen in the lower left, seems almost an afterthought in Cabanel’s composition; clearly, it is Eve’s story that he feels must be told. The multiple studies, sketches, and versions of Paradis Perdu that Cabanel created in his efforts to “master the human figure,” as he wrote to his brother, were considered as valuable as the finished works themselves. In 1867, the same year that Paradis Perdu was completed and exhibited, the esteemed art dealer Knoedler bought reductions of several of Cabanel’s Salon paintings for Israel Corse of New York, for an average of 10,000 francs each. (Cabanel’s main market during his lifetime, but particularly at the height of Pardis Perdu’s fame, consisted of American collectors, including William Astor, Jay Gould, William T. Walters, and William H. Vanderbilt.) Reductions also entered the US collections of Henry Gibson and John Wolfe, who were already the satisfied owners of versions of Cabanel's Birth of Venus, H. W. Derby, Mrs. A. E. Kidd, and J. H. Warrant. (Decades later, the Dahesh and Metropolitan Museums in New York would add Cabanel reductions to their gallery walls.) So popular were these works that contemporaries noted that they were often “purchased before they leave the easel, or, indeed, before they are half finished,” (Lucy Hooper, “Art in Paris,” Art Journal [New York], n.s. 2, no. 3 : 90). That the Gallery 19C version of Paradis Perdu was not purchased before its paint had dried is evidenced by an 1889 inventory of Cabanel’s possessions at the time of his death (it is listed as no. 29), and by a contemporary photograph of Cabanel in his famed Paris studio. The painting hangs behind the artist’s desk, its prominent location on the wall suggesting the importance it held for Cabanel, and his reluctance to let it go. The technical vocabulary surrounding the Gallery 19C version of Paradis Perdu is critical to understanding its importance. Different than a sketch, study, or reduction intended for engraving or immediate purchase, the present work is a later, nearly identical, version of the original painting, magnificent in scale and finish. As Patricia Mainardi has written: “The correct term for an artist's later version of his own theme … was … répétition, the same [value-neutral] word used in performance for a rehearsal. In performance, we never assume that opening night is qualitatively better than later presentations – first performances are, in fact, usually weaker than subsequent ones, which gain in depth from greater experience and familiarity with the material,” (Patricia Mainardi, “The 19th-century art trade: copies, variations, replicas,” The Van Gogh Museum Journal 2000, pp. 63-4.). The present version of Paradis Perdu, then, the only such répétition recorded in the Cabanel literature, may be regarded not merely as an art historically valuable replica of a lost painting, but as a personal challenge by the artist to himself, to offer to the world what he believed to be his best performance yet.